Well, I mentioned earlier that I broke the Lug’s computer last week. 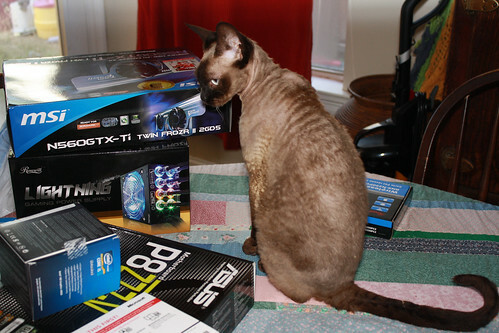 Well, the new computer arrived yesterday, and a friend came over to help him put it together. I’m glad that is mostly resolved, but we still haven’t found a great place to put his new computer – his last one was a laptop. Right now it’s sitting in front of my desktop machine, which is okay temporarily but it’s not going to work forever. I don’t really work a lot from my desktop, although I was thinking about moving back to it during the day for work. I don’t know. We’ll figure something out. Maybe put him in the closet in the sewing room? I think that would be fine when I’m sewing and he’s on it – but what about when we raid and are gaming together? Blah. Annnyway…. So this is my first project for my Quilting Quickly class. 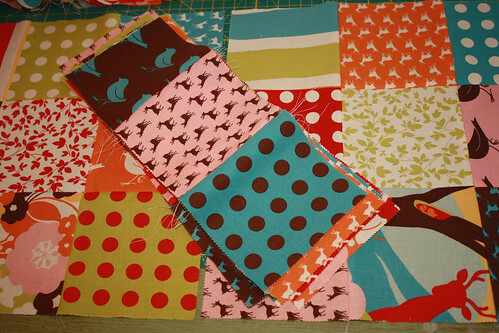 Using 5″ charm squares I’m making 9 patches and I’m going to sash in between with white. For a bit I was thinking red, but there’s a lot of red in there, and I don’t want any squares to bleed into the sashing. Maybe I’ll put a red border on it when its all said and done. We’ll see. But I am really trying hard to do everything right. Nesting the seams, matching the points, yadda yadda. It’s funny though, I’m not having any trouble at all matching the points and getting the seams to lay flat on my Sparkle Punch project – but this one is giving me trouble. Which is really kind of frustrating, because even though I’m self taught – I’ve kind of been doing this for a while now. This shouldn’t be hard!